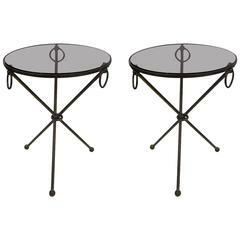 Pair of brass gueridon from France, designed in the 1950s. Original patina with new smoked glass. Bronze mask on marble plinth, unsigned. 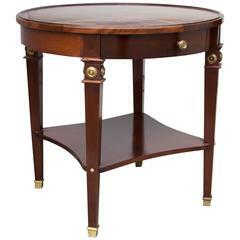 Brass and Carrara marble gueridon by Maison Charles (signed), France, circa 1950. This pair of gueridons is composed by a bronze foot topped with an oval marble disc designed by the Studio Glustin. Price is for one, two are available. 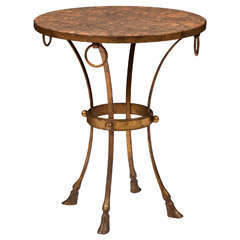 Victor Roman bronze gueridon. Signed and numbered 4/8. Glass could be larger. 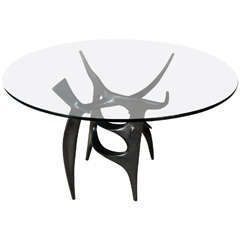 Hand painted lacquered table by Alessandro for Baker. 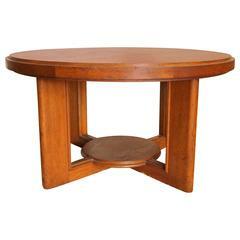 Oak large gueridon by Vallin. Original condition. Plain wood. 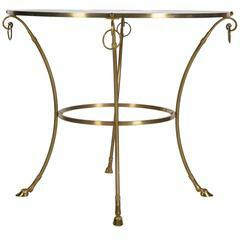 Gilt wrought iron gueridon designed by Maison Ramsay, 1940s, France.